On my desk at work, I have had a calendar for 2016 since the start of 2015. We are planning a multi site moved into Central London and are always checking how things will work logistically. Filling up that calendar brings worry & apprehension because as much as you can plan for that sort of things, there are many factors outside of your control. Filling my personal calendar for 2016, especially my race calendar, is a different story. It is fun to think about the places racing will take me and gives me a goal when trying to fit in exercise sessions mid-week (one of these days I will add strength training!). 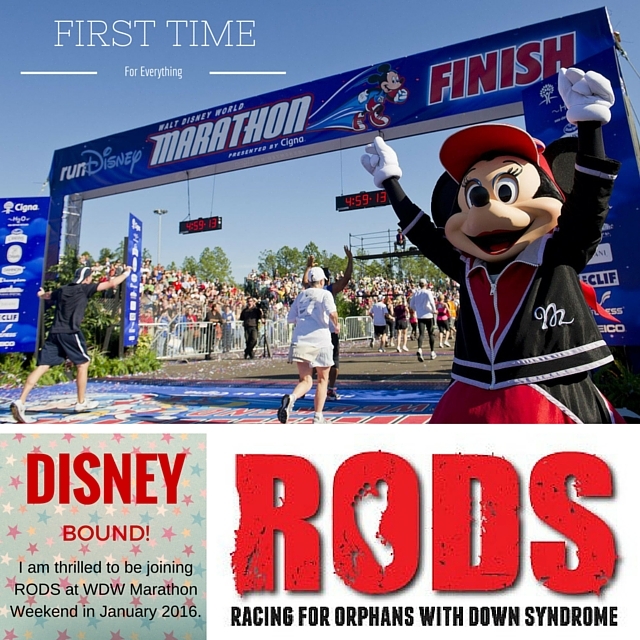 The year is starting off with a half marathon in Walt Disney World, Florida with the team from RODS Racing. It will be my farewell as I am leaving the team after nearly 4 years. I have raised $5,000 with help from friends, family, and my blog followers and cannot thank you enough for your support. I joined the team as a way to mourn my nephew with Down Syndrome who was stillborn. I hope he is proud of the work I am done to raise awareness for this amazing cause. I am aiming to raise for £850 ($1300) by 7th January so if you would like to give, please visit my donation page here. 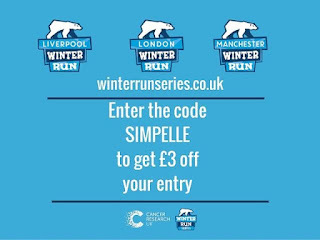 Next race on my list is the London Winter Run. I did it last year with my friends Pattie & Georgie, followed by brunch with 20+ of the ladies from Team Naturally Run. Its founder and fearless leader, Leah, was moving away making this the last time many of us would see her, apart from a sweaty hug during the London Marathon. I am looking forward to running it again this year as the route truly is magical. You will find yourself running down some of London's busiest streets with amazing views of the sites and no traffic. 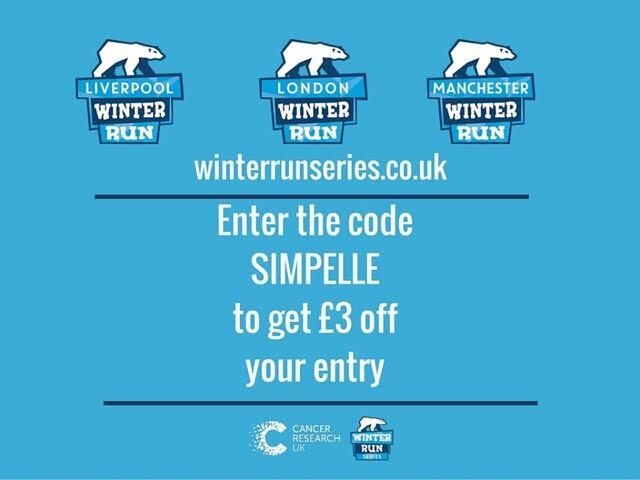 Join me at the London Winter Run with my friend Elle's awesome discount code SIMPELLE, which will take £3 off your entry. You can use it for any of the race locations. Score! On 13th February is the Usual Suspects Race with Saxons, Vikings, and Normans Marathons and Challenges. My friend Lucy found it and it fits in with our marathon training plan of 20 miles (see next race). This is a fancy-dress-encouraged-run-as-much-or-a-little event with a looped course and 6 hour time limit. She is worried she will want to do the extra lap to make it a marathon, whereas I know I will be looking forward to finishing after the 20 mile mark. Rumor has it, these people love to feed you during a race so I am not sure I will see a calorie deficit that day but I bet I will be really happy. Vegans are able to select a vegan goody bag. How is that for all inclusive? Next up in my race diary is Mill Hill Marathon on 6th March. As I previously wrote, this is my no pressure marathon, and I am enjoying training with colleagues on my lunch break (even though she makes me do hill repeats). This way it is light out and breaks up my day a bit with a nice release of stress-busting endorphins. The course is in the same areas as work, meaning I cannot go out for a run without running up and down a few hills. The weekend after that is the North London Half Marathon which will a casual fun run as I am not sure how recovered my legs are going to be. The course is new this year, although still running stadium to stadium, and I enjoyed last year's event, aside from the crappy weather. Have you signed up yet? I am sure some other events will be sprinkled in between March and July, but the next race in the diary is Ride London on 31st July. Somehow I have been lucky enough to win a ballot the first 3 years of the race. I deffered my 2015 entry as I was supposed to be focusing on the Berlin Marathon (oops), so 2016 will be my 3rd attempt at finishing all 100 miles. 2013- got a flat and just missed cut off to ride up Box Hill, bringing my official distance to 90-something miles. My husband likes to point out that I did indeed ride over 100 miles that day as we cycled to and from the course but to me, it isn't the same. 2014 was the hurricane, meaning no one was able to ride all 100. I think it was about 85 miles as both hills were eliminated from the course. 2015 I wasn't there but sadly a gentleman suffered a heart attack on Leith Hill which impacted most riders. Here's to hoping I am so speedy in 2016, I finish strong! I have spoken to a few people about training and look forward to getting started. My poor bike is feeling abandoned as she sits in the shed. In August, I will be running laps in the dark with UK Fitness Bloggers once again for the Spitfire Scramble. You seriously need to get a team together and join in the fun. I met some amazing people and challenged myself in a whole new way (camping, running in the dark, not showering for 2 days but running a lot, living on bacon butties). September brings me to Berlin for the marathon. It is the week after a friend's wedding in France, which means I will have a nice holiday in the lead up to the race. Just need to reign in the alcohol and dancing and I should be fine. Can I wear trainers to a wedding to avoid twisted ankles and blisters? The big question mark in the diary is the Turkey 70.3 Ironman. I was invited to do this race this year but only given 1 month's notice which wasn't enough time to train. I am hoping to align my Ride London and Berlin Marathon training to ride a wave of athleticism to the coastline of Turkey. I was really lucky to be able to check many of the coveted London races off my list this year- London 10,000, British 10K, Back to the Stadium 10K, and the Royal Parks Half. With bigger events in August and September, I want my training to focus on those. Races break up the training mesocyle though and add some fun, so I will see how my cash flow is. Race entries, travel and extra trainers do tend to add up. Which races are you committed to in 2016? Have you started training yet? That is great to hear Areta. Which ones will you sign up for?